← I’m gonna be a big star, Ma! 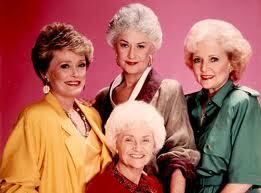 Which Golden Girl is the New Girl? It’s a question for the ages. Whenever a new ensemble comedy premieres with a cast of four, it is inevitable that you will ask who is Dorothy, Rose, Sophia, and slutbag (and my idol!) Blanche Devereaux. Thank you for being so iconic. And great shoulder pads Dorothy! They just took the bad with these outfits and hairdos. Mrs. Garrett has better taste! You see where I’m going with this. And now that one of my favorite new shows has just concluded for the season, we’re going to play the same game. Yup, New Girl, it’s time for you to get the Golden Girls treatment. Schmidt sees a tail he wants to chase! No Winston, not you. Nick: This was a tough one. He’s cynical and a lost soul (oh how I can relate!) and confused about love. While I adore everyone on the show, I actually find him the most real. And that’s why I gotta go with Dorothy for him. Caroline is his Stan, but less charming. Schmidt: This is another easy one. And you know Schmidt himself would agree . . . yes, he is the Jewish Blanche Devereaux of the group. Romancing Cece and her roommate at the same time, always talking about his insatiable need to satisfy his private parts . . . that’s straight out of the book Blanche wrote. Winston: Ugh, again by default, he’s gotta be Sophia. I feel like such a racist. I would even say he’s more like Miles Webber, but that’s not how we play the game. Luckily for us, New Girl has been renewed for a second season, so we will have the opportunity to cast Barbara Thorndyke, Big Daddy, Uncle Lucas, Clayton Hollingsworth, Laszlo, Jean the lesbian, and more in future episodes! Even though the season is over, this is not the last you’ll hear from me on New Girl, by the way . . . .
1 Response to Which Golden Girl is the New Girl?